General Banks is wearing a double-breasted 18-button frock coat with the buttons grouped by threes, as regulation for a major general. The buttons would be general staff type buttons, which are regulation for a generals. His epaulettes indicate he his wearing his uniform as dress and would have two stars on the strap. His sash was a gold color and his sword belt is a general officer's type. At his side is a presentation sword. Nathaniel Prentiss Banks had been a governor of Massachusetts at the beginning of the Civil War. He was an pragmatic and influential politician, but he may have changed parties too often, having been both a Democrat and a Know-Nothing prior to associating with the Republicans and supporting Lincoln. His past may have disqualified him from service in the cabinet, so Lincoln commissioned him as a Major General of Volunteers on May 16, 1861. Banks had no military experience and had the misfortune of being pitted again Stonewall Jackson during the valley campaign. His future conduct of operations at Port Hudson and the Red River campaign did little to enhance his reputation as a soldier. Banks left the Army in August 1865 to return to his political career. The chapeau de bras is only rarely seen in Civil War images, but was a regulation optional headgear. The regulations stated that a light French chapeau was optional for generals, staff officers and chaplains. The chapeau evolved from the tricorn hat of the Revolutionary era. 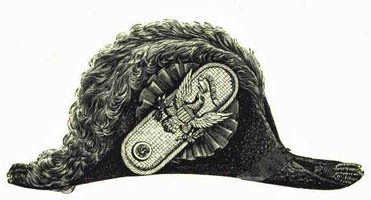 In the case of the chapeau or "bicorn" the front and back were cocked up and an ornamental cockade and strap with eagle were displayed in the front. Chapeau came to be worn in a "fore and aft" style rather than the side-to-side "athwart" style of Napoleon. Chapeaux de bras continued as a dress item into the Twentieth Century and was not given up by the Navy until 1940. "At 12 o'clock noon General Keyes, accompanied by Couch, Peck, and Graham with their respective staff, called upon President Lincoln. General Keyes was dressed in his ordinary uniform with shoulder straps, trouser tucked into his boot tops and with cover on his forage cap. The other generals worn full dress uniforms, chapeaux, and presented a marked contrast to General Keyes."